This morning I’m a small bit disturbed by a radio show inviting wedding bands Ireland to come on and discuss their Bridezilla stories and tales experienced at weddings in Ireland. Is there any such thing? I’ve met a few stressed brides – but only a few – and they certainly were not Bridezillas. One was stressed as her father was quite ill at the reception, another few preoccupied by nerves and a few who shouldn’t have actually had a big wedding. but I’ve ever heard of brides getting annoyed due to the incompetency of their suppliers and vendors. Band being late – Not Us BTW. We’ve never even been on time – only early. Groom gets drunk – bride gets angry – That’s natural – not Bridezilla behaviour. From the entertainment perspective you CAN PLEASE EVERYONE AL THE TIME (OK a guest or two may not agree with the happy couple’s choice of music but you can at least say you are playing their list). As long as you as an entertainment supplier and wedding band are prepared to put in the effort, get to know the clients, their tastes and that of their guests you’ll be the best in the world. 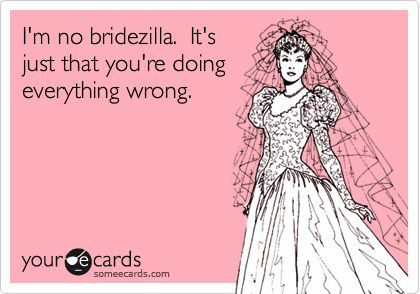 Ignore your customers preferences at your own peril – you may well end up using the term ‘Bridezilla’ more often. Here are a few tips for entertainers considering playing at wedding celebrations. Be a live band – forget backing tracks as you have zero flexibility. Find out what vibe the guests like – play music they love and don’t play music that they might hate. Entertain – communicate with the crowd. If they like you they’ll engage. Get to know your customers and crown BEFORE THE EVENT. No point arriving with a pile of music in your machine that no-one likes…. Finally (and most importantly) MAKE SURE IT’S FUN!! !